Vicious Rumors & Vile Gossip: Something Turbo This Way Comes | The Watercraft Journal | the best resource for JetSki, WaveRunner, and SeaDoo enthusiasts and most popular Personal WaterCraft site in the world! It is a sobering reality when one realizes that the innovation and technology that appears on the latest personal watercraft has often lived a vibrant life of several years on another vehicle within the manufacturer’s respective catalog; Kawasaki’s STX-15F is powered by the identical 1,498cc engine borrowed from the Ninja ZX-14R sportbike. All current ST3-based Sea-Doos feature the same LCD dashboard taken directly from the Spyder three-wheeled motorcycles – even down to the turn signal indicators. Like the youngest child in a large family, PWC are last to receive the well-worn hand-me-downs. This pecking order of technology does have its benefits, though. By the time a new engine, electronic fuel injection system, induction system or other engine management software lands into our laps, the manufacturer has had plenty of time to work out the kinks and troubleshoot the bugs. In fact, it’s a bit of a blessing. It also permits the aftermarket tuners to glean from the original powersport’s pool of tuners to quickly adapt performance parts. This process permits the PWC industry some of the fastest turnaround from introduction of a new craft, to development and manufacture of performance parts, to finally, the open market. 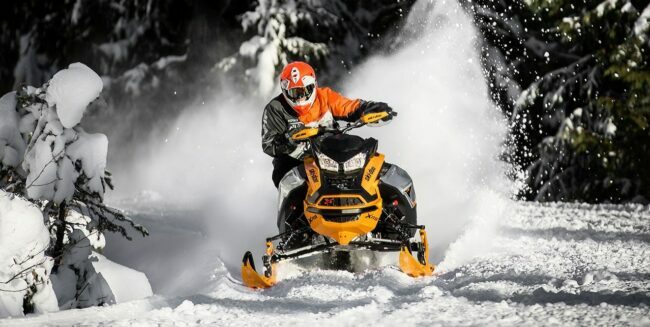 Above: Can-Am and Ski-Doo are enjoying increased market share and enthusiast response thanks to their respective transition to turbocharging its 900 ACE engines. Eking more power from smaller displacement engines is fetching plenty of class leading sales for both powersport brands. Due to the size and scope of Bombardier Recreational Products’ (BRP) array of brands, Sea-Doo benefits from a generous family of market-leading vehicles to cull from. As noted, the current full-sized runabouts (categorized by their ST3 platform), employ the Spyder’s all-digital LCD dashboard for the 2019 models and beyond. 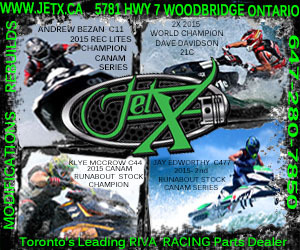 Beyond that, Sea-Doo shares the same operating software and engine management hardware – iTC (Intelligent Throttle Control) – with all Can-Am and Ski-Doo vehicles. Equally, Can-Am’s side-by-side 4-wheelers all use Ergolock-branded ergonomic designs throughout the cockpit (although the application between a SxS and a PWC are vastly different). Moreover, all three branches – Sea-Doo, Ski-Doo and Can-Am (SxS and Spyder) – employ BRP’s Rotax ACE (Advanced Combustion Efficiency) technology in a variety of engine applications. 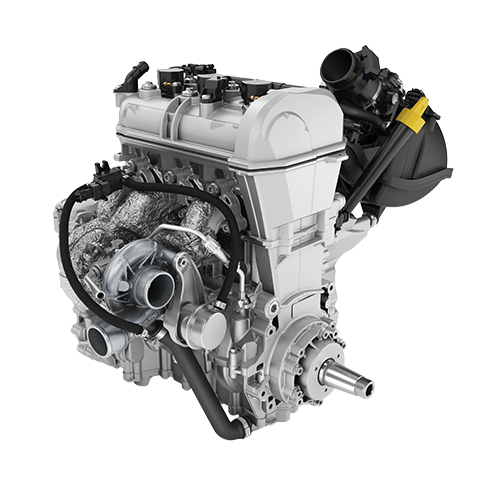 For Sea-Doo, the first application was the direct crossover of the 900 ACE engine from Ski-Doo for the introductory 2014 Spark. At 899cc’s, the 4-stroke three-cylinder provided either 60 or 90-horsepower from a powerplant weighing slightly over 120-pounds. Later, the same ACE technology was applied to the supercharged ACE 300 engine powering the RXT-X 300, RXP-X 300 and GTX Limited 300. At 1,630cc’s, it’s the biggest displacement engine offered by any of BRP’s powersport lines. For lesser-tiered supercharged Sea-Doos, a 1500 HO ACE was introduced, producing an advertised 230-horsepower (found on the GTR 230, GTR-X 230, RXT 230, GTX 230 and GTX Limited 230). For those looking to save a few bucks at the pump, naturally-aspirated Sea-Doos are the last to carry the 4-tec 1503 Rotax. At 1,494ccs, the 4-tec is the longest-running engine Sea-Doo has employed in nearly 20 years, eking out either 130 or 155-ponies the old fashioned way. Interestingly, when introduced to the then-new 1500 HO ACE engine, The Watercraft Journal asked if the same long block would eventually be used for the current naturally-aspirated models. The answer was no. Above left: The Ski-Doo Renegade X RS Turbo features a 899cc 900 ACE Turbo pushing 12psi of forced induction to a maximum of 150-horsepower. Above right: The Maverick X RS Turbo produces a class-leading 172-horsepower. The extra 12 horsepower is attributed to Can-Am’s air induction system and intercooler. Now, we have learned why. The 4-tec 1,494cc engine is due to be retired for 2020. At 18 years, the 3-cylinder has enjoyed a long and fruitful career. In its stead will come something that is sure to surprise many: the 150-horsepower Rotax 900 ACE Turbo from Ski-Doo’s snowmobiles – most famously, the Renegade X-RS. Well, OK. Not exactly. While the Ski-Doo limits the top revolutions to a conservative 7,750rpm, and stock 900 ACE’s with the HO tune see 8,000rpm regularly, we expect the marinized 900 ACE Turbo to spin closer to 8,600rpm. As noted, the output delivered by the Ski-Doo 900 ACE Turbo is a square 150-horsepower, 5-ponies shy of the current engine. While minor adjustments to the AFR (air fuel ratio) curve could quickly amend that, we see the gains made by trading out the heavy 1503 4-tec for the lighter powerplant. Plus, the Ski-Doos are pressing 12psi of boost down the ACE’s gullet, which when compared to what stock ACE 300 engines are spinning, is child’s play. Turning up the wick to 16 or 18psi could not only pick up the missing 5-horsepower, but push the 899 3-cylinder closer to 160. 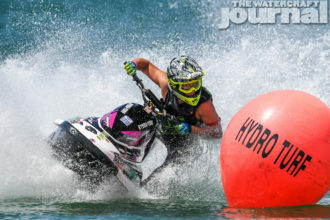 Again, these aren’t earth-shattering numbers, but for Sea-Doo’s Recreation segment, a freshly-minted turbocharged plant is something to talk about. 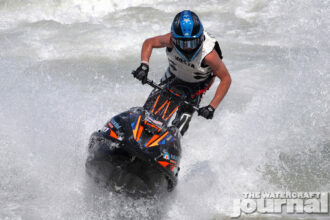 More importantly are the implications of what the new 900 ACE Turbo means for the Sea-Doo Spark. Talk of a race-ready Spark – colloquially known as the “Spark X” – have been swirling long before the Trixx ever saw the light of day. Even as forums and message boards have been pontificating over the X’s impending arrival, Yamaha managed to steal a little of Sea-Doo’s thunder by releasing the shaved-down and tuned-up EXR. Now with Yamaha’s racy Rec Lite soaking up the spotlight, Sea-Doo is not one to share center stage for every long. Above: Southern California Rec-Lite racer Justin Black thought this “prank” decal would garner a few laughs on Facebook. The viral response was far more than he ever expected. Any hopes of the 900 ACE Turbo being made a reality were publicly tested when Southern California Rec Lite racer Justin Black pranked his Facebook friends by slapping a “Spark X 150” decal on a new Licorice Black Spark 2-up earlier this month. The response was far wider and louder than anything Justin could have ever imagined. 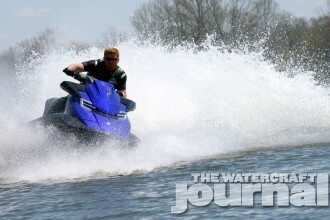 “We thought it’d be funny,” Justin told The Watercraft Journal. “I had no idea how far it’d go. People went &#$%-ing crazy.” Little did Justin know how close to the truth he really was. 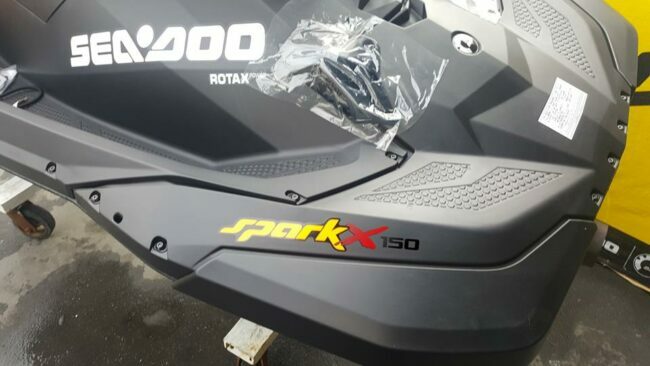 Aftermarket tuning of the Sea-Doo Spark was nearly instant thanks to – as noted earlier – the shared technology already pioneered on previous vehicles. Currently, major gains have been made by race teams in Thailand who are developing both fiberglass and carbon fiber hulls for the Spark. As it stands, the numbers coming from Pattaya are staggering; 78mph on fiberglass hulls, mid-80s on carbon fiber – with a great deal of potential still left on the table. The Watercraft Journal also received word that the Thai teams are helping test the soon-to-be-released turbocharged Spark X, reaching “conservative” speeds of 62mph in stock trim. It was communicated months earlier that Sea-Doo’s central focus for the next two years has been on properly launching the FishPro and placing it in the right places and in front of the right eyes; and dramatically re-energizing the Spark brand. The Trixx was a tremendous success that first year, and Sea-Doo wisely knows that the X is both hotly anticipated and due to make its long awaited entrance. 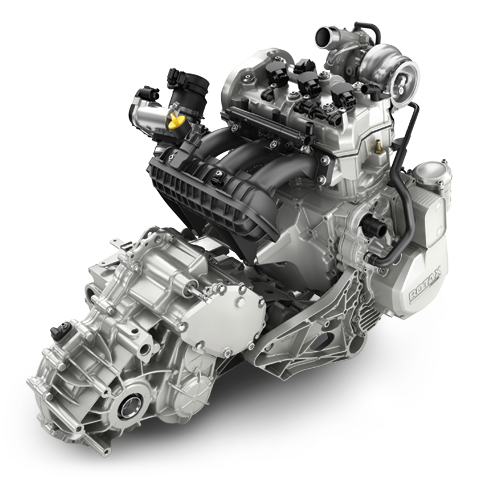 The transition to turbocharging across BRP’s Ski-Doo and Can-Am brands has been a wildly successful one, and with it (and the cost of development), BRP seeks to wisely recoup that investment as quickly as possible making Sea-Doo’s reception of this technology all the more logical for 2020.